See a garden snail up close. Watch snails moving and eating in a speeded-up video. Find some ideas for looking at snails to find out about them. See how to draw a snail. A fascinating look into the world of snails for beginner readers ready to tackle slightly more complicated storylines and sentence structures. 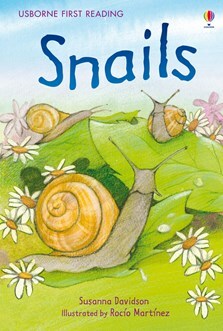 Full of facts about what snails like to eat, where they live and how they lay their eggs. Includes several pages of reading-related puzzles and internet links via the Usborne Quicklinks Website.